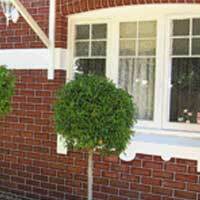 Established in 1980, we specialise in renovating the outside walls of your house or building. We know how to make your home present beautifully. Whether it is wall restoration to old homes and buildings or new additions to match the old. We always accomplish the clients needs with quality and close attention to detail. • Ornate profile cement work and restoration. • Restoration of all types of render. 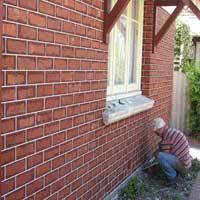 We do all types of tuckpointing, and discuss with the client the color and width of line etc. We are skilled at matching the new work as close as possible to the old. We use only the best materials for ultimate durability of our work. We can provide an attractive and professional job that you will be proud of. 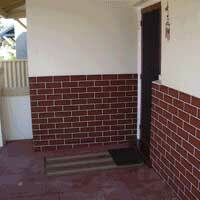 We also specialize in restoration of fretted brickwork. 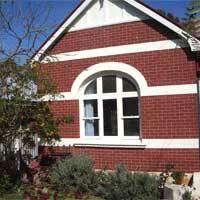 The repairs we do are always an excellant match to the original brick joint finish, and we are able to cure the cause of the problem, using the best modern materials. Every job we do, is a great reference for our business. We guarantee you will be satisfied with our service and competitive prices. We are an established business for over 25 years specialising in tuckpointing and brick and limestone wall restoration. We are always prompt, courteous and professional. Over a long time we have developed our methods and materials to achieve first degree quality and durability. We are able to produce a superb finish in keeping with period buildings Also we can repair any type of fretted brickwork to match the rest of building. © Copyright 2009 Flynn Tuckpointing. All rights reserved. Flynn Tuckpointing is a proud member of the Tradies network.